Eyelash extensions or false eyelashes? Which to choose? Well, false eyelashes are certainly cheaper, and they can be easily removed if you decide you don’t want them. The problem is they can be easily removed even when you do want them: in warm weather, or wet weather (unlike false lashes, extensions are water resistant), or if you are taking part in rigorous activity such as sport, false eyelashes may decide all by themselves that they don’t want to be attached to your eyelids anymore! 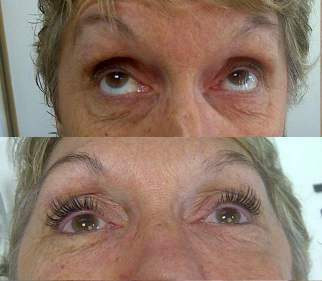 With eyelash extensions that worry simply doesn’t arise. Whatever the weather and whatever you are doing, you can be 100% confident that they will stay in place. And there are other advantages: semi permanent lashes look far more natural than false ones, and they feel more natural too; they are lightweight so won’t weigh down your eyelids as false lashes do. And because extensions look more natural they are therefore of better quality. Even the best false lashes will look, well, false. Extensions, however, will look like thick, lustrous, beautiful and wholly real eyelashes. More importantly, because the extensions are unique to you, designed to complement your eyes, they will look like they belong to you, whereas a set of false lashes belongs to whoever buys them! And think of the time you will save! No more precious minutes in front of the mirror trying to get false lashes straight, trying to get them to stick (and praying they’re good for the rest of the day!). Unlike false lashes, extensions don’t need to be removed when you shower, or sleep, or if you were to go swimming. Semi-permanent, they will last for up to a month. Eyelash extensions are affordable and are carried out by a lash extension specialist who will discuss with you what you need before any money changes hands. It is a bespoke service: the eyelash extensions you receive will be different from anyone else’s, as each set is as unique and individual as you are.